I will search any area for your lost items as long as it can be done legally and with the property owners permission, including water searching up to 4.5 feet deep. I will work for you on a reward basis. That means you pay me what its worth to you and what you can afford to pay me to find your lost item. There is a call out fee of $20.00 to cover my gas within 25 miles of my location. If you live outside the 25 mile area contact me and we will work something out. Fee for Insurance recovery items will be negotiable. Insurance Loss Recovery, Law Enforcement Evidence Recovery, Etc. I have been enjoying the hobby of metal detecting for the past 23 years and I love it as much today as I did when I first started, if not more. 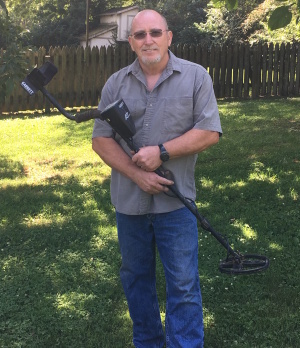 I own three metal detectors which allows me some flexibility, depending the area and the item I am searching for. I understand very well the emotional stress that comes with losing an item that was a gift from someone special or an irreplaceable family heirloom. There is a bond to the past that is severed with such a loss and my goal is to repair that emotional connection by returning the lost item to you. It gives me great satisfaction to return to you what you thought was lost forever.